The Barang Regional Alliance has now officially been established, with the inaugural Board appointed. Barang is a new Central Coast organisation aimed at empowering the Aboriginal community of the Central Coast through a unified voice. 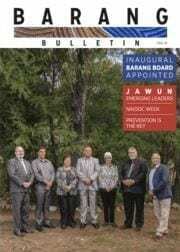 Barang currently has six members – Darkinjung Local Aboriginal Land Council, NAISDA Dance College, Bungree Aboriginal Association Inc, Bara Barang Corporation Ltd, Mingaletta Aboriginal Corporation and Ngaimpe Aboriginal Corporation (The Glen). The Board is composed of a representative from each member organisation. The inaugural Board members are Barry Duncan (DLALC), Kim Walker (NAISDA), Brody Naden (Bungree), Andy Grauner (Bara Barang), Dianne O’Brien (Mingaletta) and Janet McKinnon (The Glen). Sean Gordon, CEO of Darkinjung Local Aboriginal Land Council, has been appointed as the Chairperson of the Board. Barang believes in Aboriginal-led responsibility and ensuring accountability and transparency by all stakeholders. Barang members will actively seek to learn from each other and support each other to best meet the needs of the community and tackle the problems and challenges the community faces. Barang will lead the Empowered Communities initiative and NSW Local Decision Making (LDM) initiative for the Central Coast region. Amongst the new organisation’s first tasks will be progressing the First Priorities Agreement under the Empowered Communities reform and the development of an Accord under the NSW LDM agenda. In the coming months, these ideas will be further developed by Barang. The establishment of Barang marks an important milestone for the Central Coast. ‘Much has been achieved to date and it is terrific to see our community organisations working together and showing leadership through Barang,” Sean said.